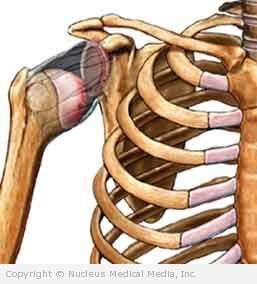 Subluxation — The humeral head moves part way out of the shoulder socket. Dislocation — The humeral head moves completely out of the socket. Anterior — The humeral head moves toward the front. This is the most common form. It typically occurs in young men. Athletes with great shoulder flexibility are more prone to the disorder. Reinjury is more common in teens and young adults, because they have more elasticity in their shoulder capsule and ligaments. This can lead to later chronic instability. Posterior — The humeral head moves toward the back. This is often caused by a severe muscle spasm, such as during an electric shock or seizure. It less commonly happens as a consequence of direct trauma, which can lead to later chronic instability. Multidirectional — This usually occurs in athletes born with very loose joints. Certain sports that require great shoulder range of motion, such as swimming, may lead to multidirectional instability. In some less common instances, patients purposely contract or relax muscles to create an instability episode, which is sometimes associated with psychological problems. Shoulder instability often results from an initial acute injury producing a dislocation. Even with healing, it leads to stretching of the shoulder capsule and ligaments. This type of injury could be due to a fall, a direct hit, or force applied to the outstretched arm. More rarely, shoulder instability develops slowly without any history of previous injury. In some cases, the shoulder may slip out of place at predictable times, such as when lifting a suitcase or even when shaving. The doctor will ask about your symptoms and medical history. A physical exam will be done. Special attention will be given to your shoulders. Your doctor will determine your range of motion and try to move the humeral head within the socket. Rest — Avoid activities that produce pain or stress the joint. Ice — This helps to control pain, especially after exercise. Surgery — Many different procedures may be used to correct shoulder instability. The goal is to fix the cause. The doctor may use an arthroscopic or an open technique. After surgery, the arm is kept from moving for three to six weeks, depending upon the procedure. Doing regular exercise to strengthen the supporting muscles. Using proper athletic training methods. Avoiding increasing exercise duration or intensity more than 10% per week. Modifying activities to prevent excessive external rotation and overhead motions of the shoulder.